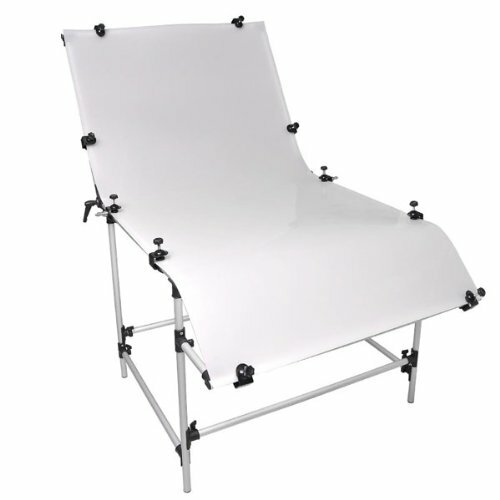 Brand New Pofessional 40" x 80" Non-Reflective Photo Shooting Table with clamps and carrying case which is suitable for all level photographers from amateurs to professionals. No need extra photoshop retouching and Save much more time. Get your perfect product pictures directly after photographing. Can be lit from above, below, behind, or around the subject for sufficient exposal and brilliant image with precise control. Adjustable back frame turns from 90 degrees to 180 degrees independently. Two light head holder attachments (C-clamps) for lighting under and above your subject. Please kindly note that the camera is just for showing the effect of the shooting table, not included. If you have any questions about this product by LASHOP, contact us by completing and submitting the form below. If you are looking for a specif part number, please include it with your message.